Tourism and hospitality is the world’s largest industry as well as the second largest employer. As a result, there are jobs at all levels of the industry. One of the best ways to get started professionally is to obtain a degree in hospitality or hotel management. This guide provides in-depth information as to the degrees available online, how to choose the right program, what students can expect when getting their degree, career paths for graduates, and even an interview with someone who is actually in the hospitality industry. Please note that the terms “hotel management” and “hospitality management” are sometimes used interchangeably in the industry and, therefore, they are both used in this discussion of degree programs. An online degree in hotel management and hospitality can open the doors for many career opportunities, from resort management to recreation to ecotourism and more. No matter what level of degree, students will learn foundations of the industry as well as business management techniques. But there are numerous specializations and degree levels from which to choose, depending on your interests and career goals. Here, we provide the top tips and schools if you’re interested in hotel management and hospitality. Florida International University's Chaplin School of Hospitality & Tourism offers a fully online Bachelor of Science in Hospitality Management for students interested in working in the international hotel, hospitality and tourism industry. The program has a strong focus on hospitality business management. The program requires the completion of 120 credits, which includes 60 program credits and 60 university core credits. Program credits include 27 Hospitality Core courses (e.g., Hospitality Information Technology, Hospitality Industry Law and Lodging Operations Control), 21 concentration credits and 12 elective credits. Program concentrations include Beverage Management, Restaurant/Foodservice Management, Culinary Management, Hotel/Lodging Management, Event Management and Travel and Tourism Management. The program requires 1,000 hours of hospitality-related internship/work hours, 500 of which must be completed while enrolled in FIU. For students interested in pursuing a master's degree, FIU also offers a combined bachelor's and master's degree to complete both at an accelerated pace. Students may apply for fall, spring or summer terms, and should send transcripts and test scores (those transferring more than 60 college credits do not need to submit test scores). Northern Arizona University's online Bachelor of Science in Hotel and Restaurant Management focuses on providing students with a liberal arts foundation combined with skills-based coursework to prepare them for careers in the hospitality industry. Acknowledging the diverse and international nature of the business, the program requires 2 semesters of a modern language so graduates are prepared to work in bilingual environments. Students gain a foundation in management theories and operational competencies in the 120 units of coursework. The hospitality administration core coursework consists of 45 units and includes courses such as Hotel Operations and Management, Hospitality Leadership and Ethics, Facilities & Sustainable Management of Hotels and Hospitality Marketing. Additionally, 12 units of business core courses and 15 units of concentration units are required. All students are also required to complete 1,200 hours of an internship in the field. The University of Wisconsin-Stout's online Bachelor of Science in Restaurant and Tourism Management program is taught by experienced industry professionals. Students must complete 120 credits to graduate, including 40 general education credits, 68 professional studies credits (including operations, organizational and fiscal management coursework) and 12 credits of professionally focused electives (or "selectives' as the program calls them). All students must also complete an internship or "co-op' experience where they put their coursework into practice. UW-Stout boasts 100 agreements with hospitality businesses around the U.S. and world for internship experiences, and a large global network of alumni who are well positioned to hire graduates. The university's 2016-2017 employment report notes that 100% of their 99 Hotel, Restaurant and Tourism Management graduates found employment. University of Massachusetts-Amherst's Isenberg School of Management offers an online Bachelor of Science in Hospitality and Tourism Management program as a way for students to complete their degree after earning an associate degree. The program seeks to prepare students for management-level positions in areas like human resources, hotel management and marketing management within the hospitality industry. Students must have a minimum of 27 transferable credits from a regionally accredited institution to enroll in the program. Most accepted students have a 3.0 GPA or higher, but that is not a requirement. To graduate with the bachelor's degree, students must complete 120 credit hours (this includes the transfer credits). Students must complete 12 general education courses, 9 business courses (e.g., Corporate Finance, Fundamentals of Marketing and Management Communications), 8 hospitality and tourism management courses (e.g., Lodging Operations Management, Service Experience Management, Human Resource Management and Hospitality & Tourism Law) and 5 upper level hospitality and tourism electives. The program has a variety of opportunities for students to engage within the industry including interaction with academic advisors with years of experience in the field, engagement with professional organizations and a career center that serves online students. Missouri State University's online Bachelor of Applied Science in Hospitality Leadership program offers students with a related associate degree an opportunity to complete their bachelor's degree completely online. Applicants must have an AAS in hospitality or culinary arts. Graduates of the program are well positioned for managerial positions in hotels, resorts and other hospitality industries. A total of 40 upper division credit hours are required in courses covering diverse subjects, including lodging, food preparation, safety and sanitation, marketing, financial analysis and human resources. Students may take 12 credit hours of upper division electives within the major and 7 additional hours of approved upper division electives. A capstone experience is required senior year. It includes a leadership course and a 750-hour paid internship in which the student gets experience in at least 3 different positions. The program boasts a vast alumni network (including those who were hired in managerial positions within companies such as Renaissance Hotels and Resorts, Wyndham Vacation Ownership, Doubletree Hotels and Embassy Suites Hotels), which can help students enter and grow in the field. North Carolina Central University's School of Business offers an online B.S. in Hospitality and Tourism Administration that seeks to prepare students for entry-level managerial positions in hospitality and tourism. To graduate, students must complete 128 credit hours of coursework (the last 30 hours of which must be completed at NCCU) with a cumulative GPA of at least 2.0. Major requirements make up 55 credits of coursework in classes such as Lodging Management and Operations, Procurement in Hotels and Restaurants, Hospitality Sales and Marketing and Hospitality Facilities Management. Students are required to complete a 1,000-hour internship in a relevant field. The University notes that program graduates enjoy a high job placement rate each year. Graduates have gone on to work in a wide range of hospitality industries, including lodging, event management, cruise lines and food service. Utah Valley University's Woodbury School of Business offers an online B.S. in Business Management with a Hospitality Management emphasis. Through flexible, online coursework, the program provides a streamlined path toward a career in hotel and hospitality management. The 120-credit-hour graduation requirement includes 35 credits of general education requirements, 45 credits of business core coursework, 13 elective credits and 27 credits specific to hospitality management. Because the emphasis forms part of a bachelor's in business, the core courses prepare students for the managerial aspects of hotel management. Examples of business core courses include Financial Accounting, Principles of Finance and Principles of Marketing. Core emphasis requirements include courses such as Survey of International Business, Marketing of Hospitality Services and Hospitality Strategic Management. The 6-credit internship requirement gives students the opportunity to apply the skills learned in the classroom directly in the field. South Seattle College offers a Bachelor of Applied Hospitality Management degree program to students who have already earned an Applied Science degree. The program covers a wide range of hospitality industry issues including human resources, marketing, hotel operation and travel to prepare graduates for advancement, regardless of the specific career track they choose. To be admitted, students must already possess an associate degree from a regionally accredited institution in a relevant area of study, such as accounting, hospitality, wine technology or business management. Within the program, students must complete 90 credit hours, 30 of which are general education requirements (e.g., English Composition, Public Speaking and Diversity and Culture in Global Travel and Tourism) and 60 credits of core requirements (e.g., Lodging Operations, Hospitality Marketing and Human Resource Management). A number of classes are offered online. Students must maintain a cumulative GPA of 2.5 throughout the program, and are required to complete an internship designed to build hands-on experience in the subjects learned through the program. Fort Hays State University's Bachelor of Science in Tourism and Hospitality Management combines a focus on working in the travel and tourism industry with the practical elements of business. The Department of Applied Business Studies emphasizes hands-on, real world experiences where students can engage in the day-to-day essentials of hospitality management and tourism through the coursework. The online program requires 65 credit hours of program-specific coursework, along with 55 general education credits, which may be transferred from previous studies to complete the bachelor's 120-credit-hour requirement. Students must choose one of 3 concentrations Hospitality Operations, Health & Wellness Tourism or Events Management and complete 12 credit hours of coursework in that area. Students must also complete an internship relevant to their coursework. East Carolina University's B.S. in Hospitality Management places a strong emphasis on business management and administration to prepare students for upper management-level positions in the industry. The degree completion component of the program can be completed 100% online. With transfer credits from an associate degree, students must complete 126 semester hours of coursework. Transfer students should have a GPA of 2.5 or higher in their prior college-level coursework. Students must also minor in business administration along with the required hospitality coursework. The hospitality core includes 45 semester hours in courses such as Multicultural Hospitality Management, Dimensions of Tourism, Hospitality Law and Hospitality Resources Management. Additionally, students must complete 18 semester hours in 1 of the 3 concentration areas (Lodging Management, Food and Beverage Management or Convention and Special Events Management). The Lodging Management concentration area (which would be ideal for students interested in hotel management) includes courses such as Lodging Revenue Management and Advanced Food Production & Service Management. The program also requires a field experience or internship in lodging management where students must complete 400 of work hours to graduate. California State University-East Bay offers a B.S. in Hospitality and Tourism for students wishing to prepare for entry-level management positions in the hotel industry, tourism, food service and restaurants or event management. The program is offered on campus, online or in a hybrid format. Both freshman-entry and transfer students can enroll in the program. Applicants should submit transcripts and test scores. While transfer students may bring in general education credits from another accredited school, the major requirements remain the same as freshman-entry students. Graduation requires completion of 180 units, including prerequisite courses (Introduction to Leisure and Hospitality, Computer in Hospitality and Leisure and Philosophy of Leisure), core classes (e.g., Service Learning in Leadership, Hospitality & Leisure, Evaluation and Research in Leisure and Hospitality and Social Justice in Leisure and Hospitality), and hospitality-specific courses (e.g., Business Communication, Fiscal Leadership for Operational Managers and Hospitality Law). The program also requires an internship course in which students complete a semester-long hospitality internship. While students are responsible for finding their own internships, program supervisors can help the student find the best placement opportunity. For students who have already earned an associate degree in hospitality services, tourism or other related fields, Granite State College offers a fully online Service and Hospitality bachelor's degree completion program. The program emphasizes the array of skills needed to succeed in the hospitality industry, including project management, leadership, communications, public relations and marketing. While 120 credits are required to complete this bachelor's degree, the hospitality program accepts the entirety of transfer students' associate degree credits as long as 30 credits are completed at Granite State College prior to graduating. About 85% of students in the program are transfer students, who benefit from a number of pathways to transfer credits, including demonstrated prior learning for those students already working in the field. Hospitality management foundation courses (of which 16 credit hours of upper level major courses are required) include Hotel and Restaurant Management, Food Service Systems and Control, Sustainable Tourism, Organizational Behavior and Quality Management. The goal of the program is to build on students' existing expertise to position them for management-level jobs in hospitality. Everglades University offers an online or hybrid bachelor's degree in hospitality management to students interested in careers in the service and hospitality industry. The program can be completed in less than 4 years and can be completed sooner if a student applies previous credit toward their degree. Online classes start on a monthly basis so students can start their degree on their own schedule. Graduates from the online Bachelor of Science in Hospitality Management program can pursue careers as supervisors, managers, assistant managers and other administrators in the service, hospitality and tourism industries. There are a range of student services available at EU, including academic advising and job placement resources. Military personnel, veterans and their spouses can apply their military benefits toward paying for their degree. Online students are able to apply for financial aid and can speak with the Financial Services Department to ensure they receive the aid they need. Numerous schools offer online hospitality management degrees, primarily at the bachelor’s level, but at the associate and master’s as well. Each web-based program is different, but below is an estimated timeline for someone who desires an undergraduate or graduate degree. Also discussed are certificates in hotel management, which can be earned at any level. 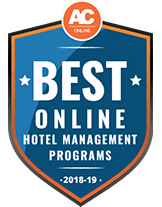 Each school has their own program timeline, but online certificate programs in hotel management can easily take less than one year and usually can be completed in about six months, depending on the pace of the student. Additionally, there are usually no prior degree prerequisites so anyone can obtain a certificate. However, these certificates are best suited for professionals who already have some experience with hotel management. Hospitality management topics covered include business operations, decision-making and leadership. Most certificate programs consist of only a few classes, but provide a robust overview of the industry and how to more efficiently and profitably run a hospitality business. While a hotel management degree at the bachelor’s level is the minimum educational qualification needed for many jobs in the hotel industry, it is not always required, especially for hotels or motels that offer fewer services than large-scale full-service businesses. The associate degree provides theoretical knowledge of supervisory and administrative roles in hospitality, but focuses on practical training so that graduates can seek work after finishing college. Additionally, this degree can serve as the first step toward obtaining a bachelor’s degree, depending on the four-year college or university’s transfer policy. Students who graduate with an associate degree learn the basics of the industry including best practices for restaurant and lodging management, managerial and supervisory skills, and the ability to communicate effectively with both customers and colleagues. By obtaining an associate degree in hospitality management, students gain the basis needed for employment in many entry-level positions. Typical coursework totals approximately 60 to 65 total credit hours and covers industry-specific subjects such as safety and sanitation, management of food and beverages, hospitality information systems, menu planning and introduction to tourism. Business related courses include accounting and marketing. General education or college core requirements can build math and communication skills through classes like algebra, English composition or psychology. A full-time student can usually complete an associate degree in two years, but those who take accelerated courses might be able to finish within 18 months or less. General Education: These include classes beyond the hospitality management curriculum in core subjects such as history, math, English, physical science, ethics, statistics, and humanities. Business: This is one of the two substantive hospitality management related areas of study. Classes may include accounting, finance, marketing, information technology, management, and ethics. These classes teach the business side of hospitality management. Depending on the school, a minimum GPA of a 2.0 must be maintained for these courses. Hospitality: The second of the two substantive hospitality management related areas of study, this is where students learn theories and concepts specific to the industry. Courses may include introduction to hospitality and tourism, food and beverage operations, menu management, facilities management, front office and housekeeping, event management, and industry-specific information systems. As with the business core set of classes, most schools require a certain GPA for these classes. In all, most hotel management bachelor’s degrees take four years to complete and amount to 120 to 126 credit hours. Schools often have a minimum overall GPA requirement in order for students to graduate. After graduation, students can explore opportunities in a wide variety of settings, ranging from theme parks to travel agencies to hotels to restaurants to private luxury clubs and resorts. A master’s degree in hospitality management is available to professionals who desire to advance their current careers and to move into more senior leadership roles in a particular area. Usually taking two years and about 45 credit hours to complete, the master’s degree curriculum enhances existing knowledge of management theories and offers opportunities for specialization. For example, students build on prior academic training and experience by taking courses in areas such as human resources, strategic management, and leadership principles. 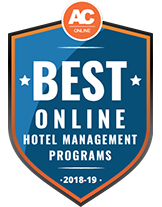 Online hotel management degrees are exceedingly popular, allowing graduates to work in a variety of roles such as special events, food and beverage management, and operations. While there are numerous options, not all programs are created equally: in addition to providing an engaging curriculum, students should also look for programs providing job placement services, internships, and opportunities to specialize their knowledge. The good news is students don’t have to go it alone: the search tool below takes all of these factors into consideration and provides a personalized list of programs for each student. Why does someone choose to go into hotel management? There can be an array of different reasons, as seen in the student profiles below. Jonathan grew up in the family business, helping to run a local motel. He would like to eventually run the motel himself, but feels he needs a bit more training before he is comfortable taking over. He already has a degree in business administration, but is concerned that it might not be enough for exactly what he needs to know. The rest of his family agrees that additional outside hospitality training would benefit Jonathan and bring in fresh ideas for more efficient operation of the family motel. However, Jonathan has neither the time nor financial ability to go back to school to get another degree – therefore, a certificate is perfect for him. Martha is a senior in high school and looking for colleges to apply to. After going on several family vacations where she received great service at the hotels her family stayed in, Martha has decided that she wants to have a career in the hospitality and hotel industry. Eventually, Martha hopes to work her way up to become a manager at a major hotel chain. Edward studied hospitality management in college when he earned his bachelor’s degree. After graduation, he immediately got a job working at a hotel as a desk clerk, gaining experience and familiarity with hotel operations. Edward quickly moved up to hotel manager, but now has aspirations for a job in senior management, overseeing multiple hotels and resorts in a given geographical region. However, Edward lacks sufficient education in areas such as gaming and international tourism. He plans on enrolling in an online master’s degree program to gain this additional training so he may advance his career. As the hospitality industry includes a broad range of environments and employers, many hotel management degree programs offer options for specialization. These concentrations are ideal for students who are already confident in choosing a particular area of emphasis. Specialization is especially common at the graduate level, where students zero in on detailed components of various areas of the hospitality industry, ranging from gaming to event planning. Food and beverage operations: This specialization focuses on restaurants and food service and includes careers in the kitchen, dining room or beverage service area. Special events: This concentration emphasizes managing conventions, meetings, and other special events at various institutions in addition to hotels, such as convention centers and private clubs. Coursework pays special attention to growth and entrepreneurial opportunities. Lodging: As the name implies, this concentration focuses on the lodging aspect of the hospitality industry, specifically hotels, motels, and bed and breakfasts. Graduates get to choose between the corporate or franchise side of lodging operations. International tourism: This concentration is probably the broadest and most encompassing of all areas of specialization. This is due to the fact that students learn about hospitality in both the domestic and international spheres. Additionally, coursework addresses less common hospitality areas such as transportation, attractions, ecotourism and heritage tourism. One area of specialization, typically found at the graduate level of studies, is gaming and casino management. Here, students learn the basics as well as advanced skills necessary to work in the gaming industry. This curriculum includes related information systems and technologies, casino financial analysis, security and risk management, current industry issues and casino marketing. Another optional specialization at the master’s level is global tourism. Similar to the undergraduate degree with an emphasis in international tourism, this program focuses on the tourism-related hospitality industry. However, since this is a master’s level concentration, coursework is more theoretical and centered on issues and strategies to improve business performance. Classes include the economics of tourism, sustainability and tourism, destination management and tourism branding. Depending on the school, these concentrations constitute about one-quarter to one-third of the total credits required for a master’s degree in hotel management. Not all hotel management degree programs are equal. Prospective students considering enrollment in a hospitality degree program should evaluate several factors in order to choose the right program. Below is a list of important criteria to consider before deciding on an online program. One of the most important factors to look into when choosing an online degree is whether the institution or program granting it is accredited. Most schools can be accredited at the national or regional level, and can have the specific program accredited as well. Accreditation ensures that a certain degree or program meets minimum quality standards. If a degree comes from a program or school that is not accredited, it will carry less weight and may not even be recognized. The Accreditation Commission for Programs in Hospitality Administration accredits many hospitality degree programs, but not all of them. According to the Bureau of Labor Statistics, only about 60 hospitality management programs are accredited. Many schools with programs that are not accredited by the Accreditation Commission for Programs in Hospitality hold accreditation at the institutional level. No matter how high the student’s GPA or how great the reputation of the hospitality program from which they graduated, they still need to put forth the effort and find employment. This job search can be a lot easier and much more successful with help from the school’s career services office. In deciding which hotel management program to attend, students should examine the resources available when it comes to post-graduate employment. Does the school have on-campus interviews? Are there alumni working at prominent hotel chains, restaurants or related employers for networking opportunities? Does the school offer interview coaching and feedback on resumes and cover letters? Does it have relationships with local or international hotels and businesses? These are just some of the questions prospective hotel management students should consider. Areas of specialization should be an important factor when selecting a school. If students want to focus on hotels, restaurants, conference centers or casino resorts, they should look for programs that offer such concentrations–sometimes a simple, straightforward degree in hospitality management doesn’t prepare students for the intense, targeted education they need to go into a specific area. As with most other professions, much of what it takes to be successful is learned with hands-on experience, not just what is taught in classes. The opportunity to gain valuable experience through internships should be a major consideration for students deciding on a hospitality program. Not only do internships provide a significant learning opportunity, they can also help the student with networking and the post-graduate search for employment. Online programs should give students the proper courses to build up specialized expertise and a general education to stand them in good stead in the workplace. These are a few examples of how common courses in hospitality degree programs can lead to useful skills and knowledge for real-world situations. Hospitality Management Information Systems Covers the computer and information systems technology commonly used in the hospitality industry. Students gain familiarity with the computer technology used in all aspects of the hospitality industry, from reservations to financial forecasting. Hospitality Leadership Students learn how to become better leaders through the study of emotional intelligence and organizational leadership techniques. Students obtain the skills necessary to manage employees and be an effective workplace leader. Sanitation and Safety Provides an understanding to maintaining safety and sanitation in a food production area. Students learn the basics of foodborne illness as well as safety protocols used in the food service industry. Fundamentals of Accounting The basic accounting concepts and theories will be taught, as well as how to prepare and analyze accounting statements. Students can calculate the profitability of a given hospitality business and understand financial and accounting metrics used to assess business. Introduction to Tourism and Hospitality The tourism and hospitality industry as a whole will be examined, including an overview of how the industry works and where it is headed in the future. Students gain a background of the hospitality industry and obtain a context for future knowledge and experience gained. Customer Service for Professionals Principles of managing a customer-centered workplace and hospitality customer service techniques are covered. Students understand how to manage fellow employees and enable them to provide excellent service. Students can analyze and improve customer service in a hospitality business. For most careers in the hospitality industry, certification or licensing is not required as a condition of employment. However, specific hospitality careers, such as those in casino gaming, may require certain licenses, depending on the state. Licensing also depends upon the position, for example, supervisors or those working in other roles, such as dealers. In the hotel industry, several certifications may be obtained. These are not required for most management positions, but they are encouraged. The first is the Certified Hotel Asset Manager, a certification from the Hospitality Asset Managers Association. This certification indicates that the individual has advanced knowledge in hotel operations and ownership and that this knowledge was gathered over a substantial number of years. A second certification is the Certified Hotel Administrator, offered by the American Hotel and Lodging Educational Institute (AHLEI). This certification signifies that the individual has obtained a high level of experience and education as a hospitality executive. For secondary school students who hope for a career in the hospitality industry, AHLEI has designed another notable certification. The AHLEI program lasts two years and teaches hospitality and tourism management principles to high school students. Upon completion of the program, students can become Certified Hospitality and Tourism Management Professionals. This is a promising program for high school students who want a head start in learning about the hospitality industry. It also provides networking opportunities that may become useful when the student seeks gainful employment after graduation. Finally, for those interested in a restaurant or food service related career, there is the Foodservice Management Professional designation. This is awarded to food service managers who complete coursework, pass an exam and meet other experience-based requirements. This designation is offered by the National Restaurant Association Education Foundation. Not all hotel or hospitality management graduates end up as hotel or restaurant managers. What are some surprising career paths for graduates of these programs? The following is a list of three careers that may not initially come to mind for hotel management grads. Event planner Events are held at many different types of locations – hotels, resorts, country clubs, convention centers and conference centers, just to name a few. Planners handle all aspects of events at these locations and work with all types of clients, from corporations and political groups to single individuals. These pros organize everything that is needed for the event and communicate with both the client and the vendors to get everything set up and running smoothly. Marketing/Advertising coordinator Hotel managers, bellhops, front desk clerks and housekeeping personnel all have the job, one way or another, of making sure guests are happy and satisfied. However, how does one entice the guests to stay at the hotel to begin with? This is where the marketing/advertising coordinator steps in to promote the hotel and attract patrons to stay at the hotel and take advantage of what it has to offer. Human resources director/executive Running a hotel, resort, club or convention center is personnel intensive, so there needs to be adequate support of the employees as well as the executive management that oversees the everyday running of the institution. Likewise, a human resources executive manages the organization’s staff, ensuring employee needs are met and law and regulations are followed. An understanding of hospitality business and management can easily translate to the world of human resource. What better way to learn about the hospitality field than to actually speak with someone who graduated with a hospitality degree and is currently working as a hotel manager. The following is an interview with Kathleen Whitty, who is currently the General Manager at the Hilton Garden Inn in Bangor, Maine. What led to the decision to pursue a position in hotel management? I was inspired to get involved in hospitality by a professor at Husson University. The way he spoke about his classes conveyed a passion that was contagious; it made me eager to learn from him. Hotel management lets me do work that I enjoy, including taking care of others and helping people create memories. What is your educational background, and how does it relate to your current job? I was homeschooled, which fed my love of learning and trained me to problem solve. Then I attended Husson University where I received a BA in Business Administration with an emphasis in Hospitality Management. My education helped open doors to advance my career and gave me a strong skill base to use at work. From business terms and theories, to computer skills and public speaking experience, I often use the things I learned in college. In hotel management, every day is different. Many days are a mix of office work and time interacting with our guests. Some days are filled with team meetings. Other days are spent working through the unexpected things that pop up in a busy hotel and event center. The wide variety keeps the work interesting. Do you have advice for students interested in entering hotel management? Whatever you do, do your very best at it every day. In the hospitality field, you are the product–the guests may think they come back for the comfortable beds or well decorated lobby, but they really come back because of the good experience you helped create. If you do your very best every day, your guests, coworkers and management will notice, and you will have fun doing it!